I know that it is possible to interpolate between different masters of one font but is it somehow possible to interpolate between two different fonts? Lets say Times and Helvetica? It is for experimental use and dont need to give perfect results. What software can I use to generate a new interpolated desktop font from two different fonts? Is there an app to generate a variable webfont that could be animated from one font to the other? Moreover, you have not included in the question the program you use or want to use to make out this operation, of course you can interpolate two different fonts, a resource widely used in the 90s inside the Decostructivist Style in graphic design. The mix could be done digitally or manually and the results where included in the called Trash Fonts. The only way to truly do this using web fonts as you say in the question is to use variables fonts, which has surprisingly good support given it's a new technology for the web. You'd have to create your own variable font based on the two fonts that you want to animate (granted you have permission to do so). I don't know of any software that could do that for you. A couple posts that I've found detailing how to create these fonts include Robofont's and Glyphs'. 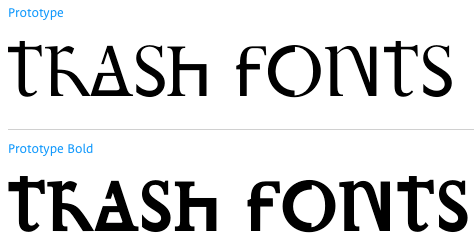 To find existing variable fonts, see V-Fonts.com or Axis Praxis. For creative uses of variable fonts, this CSS-Tricks post is pretty good. If you don't really need a true web font (say the text is fixed or something similar). It would probably be easiest to change the text into an SVG and then use something like After Effects to animate the transition. The next easiest thing would be to again convert to SVG and then use an SVG morph animation to go between the two, using something like GSAP's MorphSVG plugin, Snap.svg, or Kute.js SVG plugin (this is the first time I've seen this one) to keep it easy (though it is possible to do it by hand). Not the answer you're looking for? Browse other questions tagged fonts animation interpolation or ask your own question. How to Overlay [Selected] Glyph Outlines from Separate Fonts for Comparison? What methods exist for determining if a font is similar or derivative work?